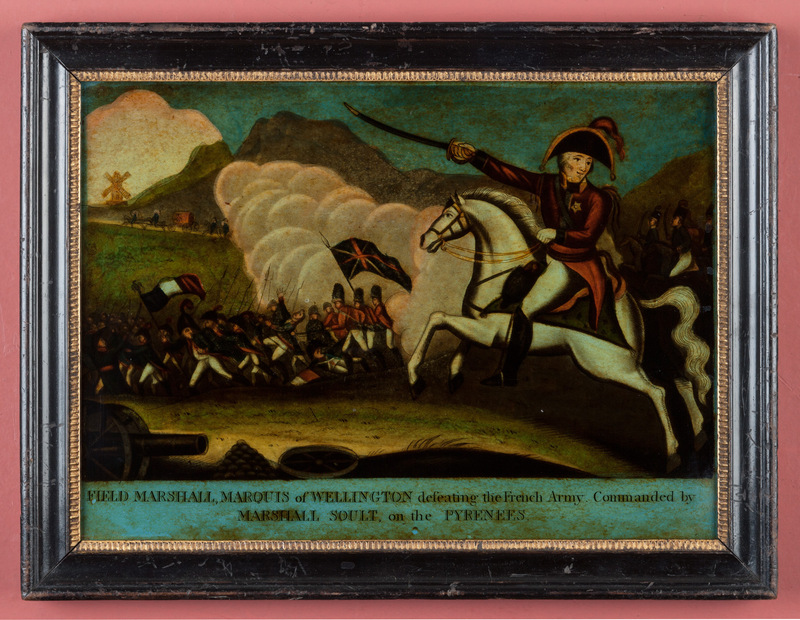 A good and rare mezzotint, laid down onto glass and reverse painted, 'Field Marshall. Marquis of Wellington Defeating the French Army Commanded by Marshall Soult, on the Pyrenees'. Within a fine, period, pearwood-faced, ebonized frame with a reeded, gilt sight-edge. The Battle of the Pyrenees was a large-scale offensive launched on the order of Napoleon, 25 July 1813. Commanded by Marshal Nicolas Jean de Dieu Soult from the Pyrénées region in the hope of relieving French garrisons under siege at Pamplona and San Sebastián. Initial success was halted in the face of increased allied resistance under the command of Arthur Wellesley, Marquess of Wellington. Soult abandoned the offensive on 30 July and headed toward France, having failed to relieve either garrison.